As the GSM mobile operators have been striving to reach out for more and wide-ranging coverage, it has always been the question of power generation in remote sites, where grid is completely unavailable, or interrupted. It has been clearly understood that GSM mobile operators would not afford even a minimal interruption of any of their sites which would probably affect their (air time) market position and lead to losing clients, and hence forgoing important air time revenue due signal absence. Since the introduction of mobile phone service in Egypt in 1996, and the attempts of the first operator to extend coverage to virtually all inhabited areas in Egypt following a plan to acquire a strong market presence, it was compelled to power remote site with diesel generators. Shortly after this solution was put in place, we started to study the feasibility of replacing diesel generators with photovoltaic systems, which initially seemed to be a logical replacement of the diesel generators. 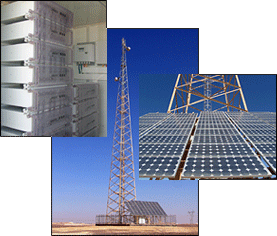 Our study focused mainly on the diesel operating cost vs. the low operating cost of photovoltaic systems. It has come clear as a result of this study, that photovoltaic systems are more efficient not only from an economic and financial perspective, but also from a convenience one. As the diesel generators needed close monitoring and continuous refuelling which has also burdened mobile operators with additional costs of reaching out to these remote sites, we approached the mobile operator with our feasibility study of replacing diesel generators with our photovoltaic systems, and presented the advantages of installing and running the system to power remote GSM sites. Since then, we have now more than 600 photovoltaic systems for Telecom Sites that have genuinely become an integral part of most remote GSM sites in Egypt and many countries in MENA region.